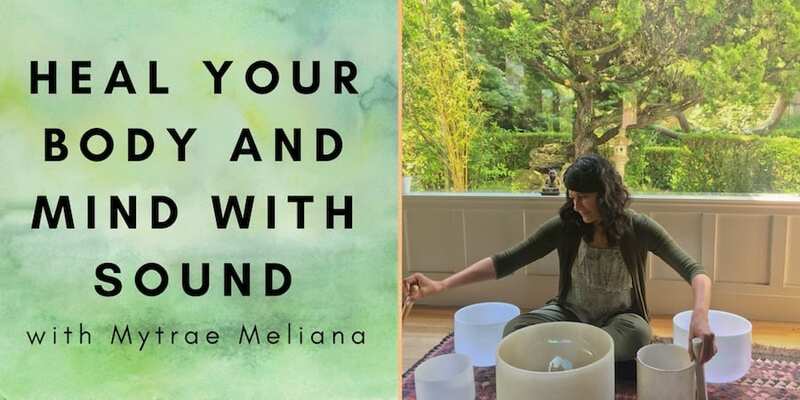 Whether you’re dealing with a challenging illness or disease, an emotional issue like depression, anxiety, trauma, or grief, or just want to renew and nourish yourself, sound healing is deeply therapeutic. Based on the Law of Vibration which states that we are energy and vibration, sound healing is a powerful modality for your body, mind, heart, and soul. One of the wonderful things about sound healing is that it completely bypasses your conscious mind. So you don’t have to “work” at it. Sound healing works with your body’s innate intelligence. All you have to “do” is show up with your intentions for healing and wellness. shores up your body and mind’s capacity to deal with physical disease and psychological issues. I recently had a powerful sound healing with Mytrae. The healing accomplished something miraculous: relief of chronic pain in my right arm and lower back. I also felt that the sound reunited my body, mind and spirit. Earlier in the day, I was having trouble focusing my vision and my thoughts. For me, this healing was much more beneficial than the massage and chiropractic treatments I’ve had to treat my back and arm pain. Mytrae is a gifted healer who effortlessly brings in energy from the Divine. Bring a yoga mat, blankets, pillow, eye mask, water bottle to make yourself comfortable. No scents or perfumes please.